An excited Mickey brings Rose, The Doctor and Jackie to the museum because he has a surprise for them. When Rose sees a statue of herself she cannot believe how the sculptor captured every last detail about her. It's not long before she realises that this means that she has to travel back to Ancient Rome to sit for it. In a blink the Doctor and Rose find themselves caught up in a search for a missing boy and trying to out think a Genie. Often books based on television series tend to miss the mark in their characterisation but I am happy to report that is not the case with The Stone Rose. Rayner gave us the Doctor's anger, his logic, his quick wit and more than anything else, his love and concern for Rose. The banter between Rose and the Doctor was absolutely perfect and reminded how much I loved the two of them together. As much as I thought that Rayner nailed her characters, the story itself felt confused and a bit all over the place. 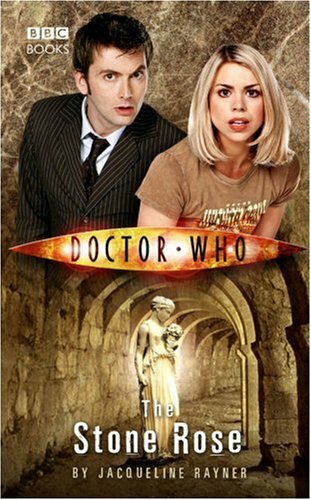 When Rose and the Doctor first land in ancient Rome, they begin by looking for a young boy who has gone missing. Then the issue becomes about a young man who has always wanted to be an artist and develops the ability to turn living people into stone. This quickly shifts to AI (artificial intelligence) genie which grants wishes and nearly destroys mankind. If you can follow all of that then there are the paradoxes and the leaping around in time. Yes, Doctor Who is all about a clever man with a blue box travelling through time but it should be somewhat easy to follow. By the end of the story, I couldn't tell whether I was coming or going. In short there were too many paradoxes to make sense. Some of the characters also felt extremely extraneous. Lucius Aelius Rufus exists simply to get the Doctor into the Colosseum to fight as a gladiator - a scene which essentially added nothing to the story whatsoever. Yes, the Doctor is always running around in an almost manic state and often takes on the bad guys in battle but it is supposed to fit into the framework of the story and not feel like an additive. It's almost as though Rayner went into this determined to get the Doctor into the Colosseum and twisted the story to ensure that it happened. Vanessa is also a very unnecessary character. Vanessa is a classic person outside of time character, the problem is that by the time the big reveal happens, it's pretty obvious. Vanessa also changed in ways that simply didn't make sense. At the beginning, Vanessa was a terrified slave and by the end she was actually quite talkative and even a bit witty. The problem however is that there was nothing to justify the change or explain it in a way that made sense. I think Vanessa would have been far more interesting if she could have actually seen into the future or had something somewhat mystical about her. I assume that this novel happens not long after the Doctor regenerates from the 9th to the 10th because of the reference to his ability to regrow his hand. It also seems to happen shortly after Mickey has come to terms with losing Rose to the Doctor. That being said, having Mickey repeatedly say that he never thought that he was good enough for Rose is a problem. It made him even more pathetic than his television character. Who would have thought such a thing possible. I can easily see Mickey mourning for Rose, worrying about how Jackie was going to take the death of her only daughter but the degree to which he disparaged himself is simply unacceptable. If you are a fan of Rose and the 10th Doctor together, you'll probably like this story. The banter between them is just what I have come to expect from this pairing. You will have over look the timey wimey paradoxes that don't make complete sense and the shifting issues. I think I might have enjoyed this more had I gotten the audio book since David Tennant read it and everything is always better with a dose of Tennant. The Stone Rose is a quick quick way to kill an afternoon and perhaps help deal with the Doctor Who withdrawal while we wait for a new season to start.